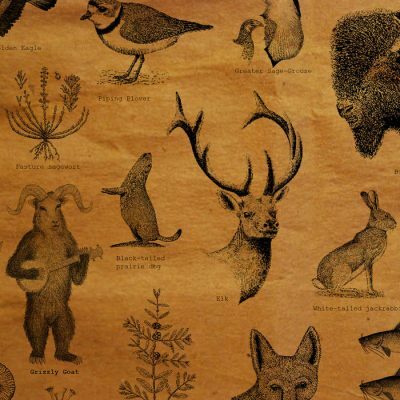 Grizzly Goat are a folk-rock band out of Provo, Utah, who just released Ursus Oreamnos Americanus, a 12-track album. Ursus Oreamnos Americanus feels like a continuation of their previous release, Boring Conversation Anyway, with quick picks and twang for sweet-sounding folk songs, but with double in tracks. Grizzly Goat seem to have matured with Ursus Oreamnos Americanus and have captured a rawness that many folk bands dismiss. The album starts with “Read ‘Em and Weep,” which opens with a raw acoustic riff on the banjo, but pauses to add a heavier bass and a clapping sound along with the same riff and dramatic pauses. “The Front Range” feels more folk-rock, still incorporating acoustic folk elements, but with heavier drums. Rather twangy and drawn out, the lyrics are sung loudly in a folk punk–like manner, often coming through in the space between dramatic spurts of a series of hard, singular hits on the drums. “Texas” evokes an old western scene, with quiet acoustic picking to start and a few underlying and distant electric guitar notes support stirring lyrics: “Texas in the morning / Trying to find your trails / Rushing through some dust clouds / Blowin’ ‘round the place / Some folks are sayin’ / I’ve been starin’ at the sun too long.” Less than halfway through, the drums pick up and frame the simple electric guitar, which starts and stops over a fast finger-picking as both vocals and instruments grow in volume and harmony, crying out, “I am lonely / But I’m free.” In the remaining seconds of the song, there is a heavy electric portion, devoid of distinguishable acoustics and perhaps snapping the listener out of a distant ghost town and back to modern-day reality. Many tracks are relatively short, averaging about three minutes long. The shortest, “Sycamore, Illinois,” is quiet and only 31 seconds long. It’s a bit uncharacteristic of traditional folk songs but typical of Americana tracks, which often center an entire track on a single thought rather than on a particular instrumental set.